Cricket was forlorn! She didn't sail at all last year, with all the energy going into the launch and rigging of Mouse. Not to mention being capsized the previous year (a first) and sailing with a split mast and mangled gooseneck. 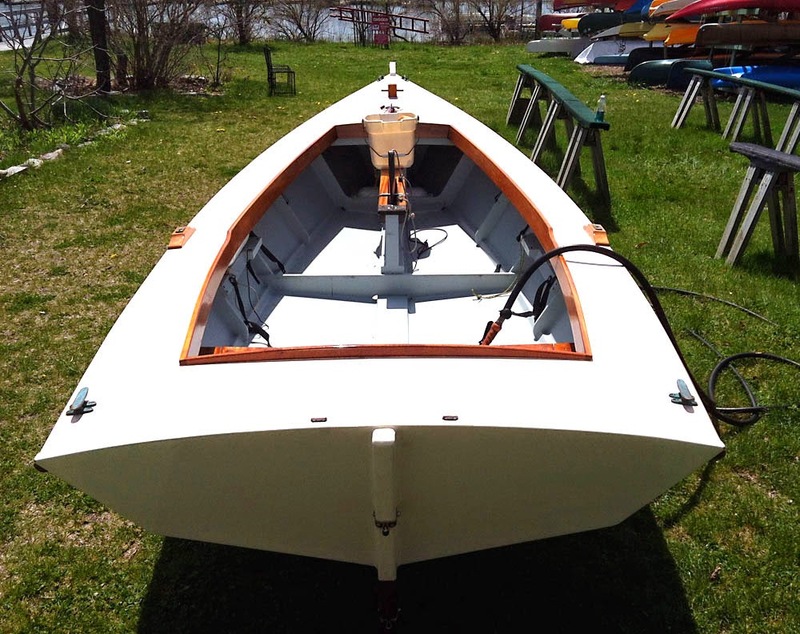 So I decided this year to do the repairs, get her rigged, and back in the water. The mast and gooseneck were damaged at the dock when a gusting wind shift caught her aback suddenly, twisting the gooseneck, and pulling out screws, splitting the mast in the process. At the time, I jury rigged a repair (hose clamps) and sailed the rest of the year, but it bothered me having to look at the damage. With Mouse pretty much complete, I set out to do right by Cricket. Cricket's paint job is 7 years old now, and still looks great. I really like having a fixed gooseneck, but there were always problems with it. 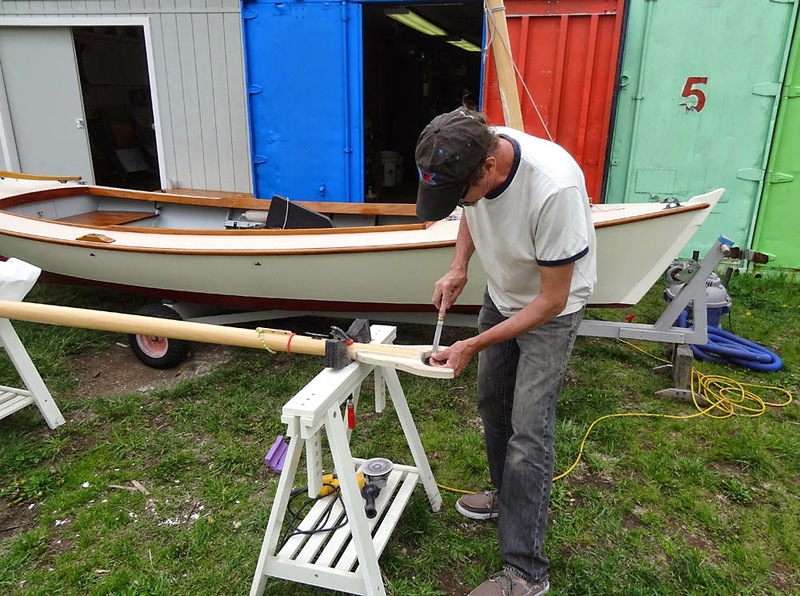 I put a round tenon on the mast when I built it, but the vang over-rotated the mast when tensioned and the boom fitting would gouge the side of the mast. So I put a key on the mast which engages a slot in the partner preventing rotation. I did this three times in fact, before I got one that wouldn't break. I put in a hardwood key first, which split off the first time I stepped the mast. Next was an aluminum key, which the epoxy would not grab onto reliably. It failed as well. A plywood key was the trick. Glue held, and ply didn't split. It suffers from abuse while stepping the mast, but has held for several years now. Anyway, the fixed gooseneck was the real source of all the difficulty, so I decided to replace it with a traditional boom jaw. I made a pattern and cut the jaws out of some ash I had around, making sure to leave space for leathering the jaws. 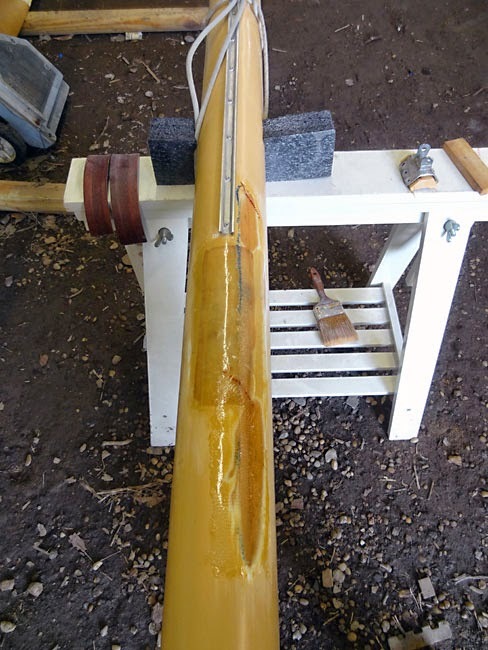 The boom is round, so to fit the jaws to the sides of the spar, I hollowed them out with a gouge and some 80 grit paper on an appropriately sized sanding drum (2" diameter). I cut the old Dwyer boom fitting off with a hacksaw and sanded off the paint in preparation for bonding the jaws. I used just two stainless screws on each jaw to lock them in place, and mixed up a thick batch of epoxy, using the squeeze-out to form a small fillet all the way around. The hollowed out bearing surface. 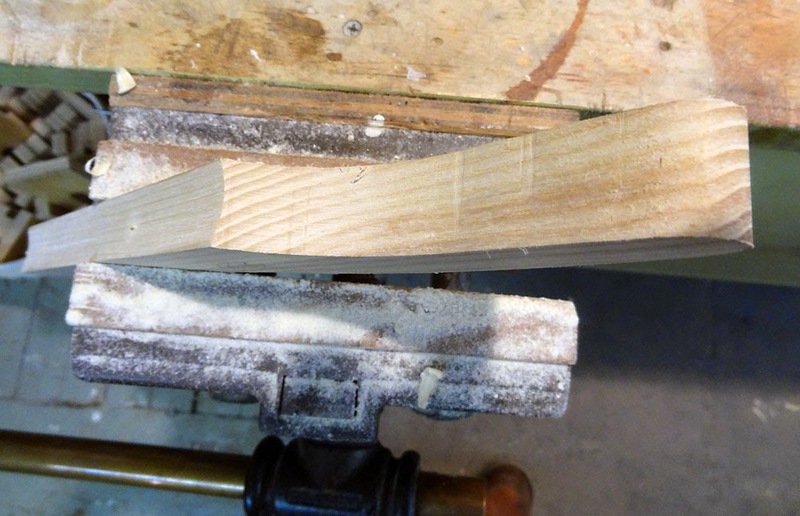 I clamped a scrap across the jaws to keep them in plane. At the same time I was making the new jaws, I began repairing the mast. I removed the old gooseneck plate and screws, then ground all the paint away to examine the splits. I could have let in some wood dutchmen, but the splits weren't too bad, so I ended up laying on some strips of biaxial glass cloth in epoxy. The mast has always been painted so this will look fine. A couple of layers of biaxial glass cloth and epoxy went on the slits. 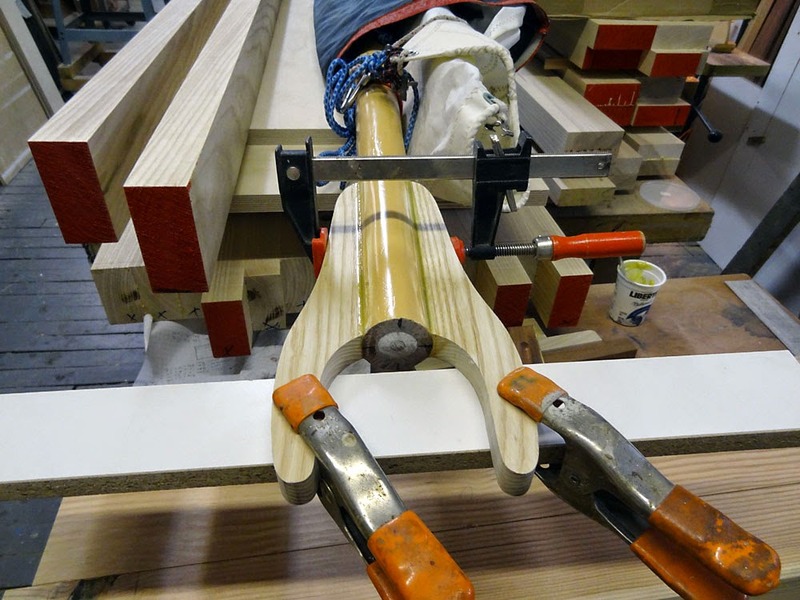 When the jaws were cured up, I did some shaping on all the corners, paying particular attention to the boom end where it bears up against the mast. I then drilled holes through the jaws for a pair of rope strops to attach the halyard, downhaul, and reefing block. The beauty of this traditional approach is (besides looking good) that it requires very little hardware. Just some bits of rope and a shackle or two. I did some painting on the spars in the boat shop. I set the rig up on the boat to check everything. A little fiddling got the old reefing lines working, but I had to change my halyard lead at the deck. The old lead came to a block on deck, just to the port side of the mast, but this location interfered with the new boom jaws, so I ended up moving the block to a position forward of the mast. 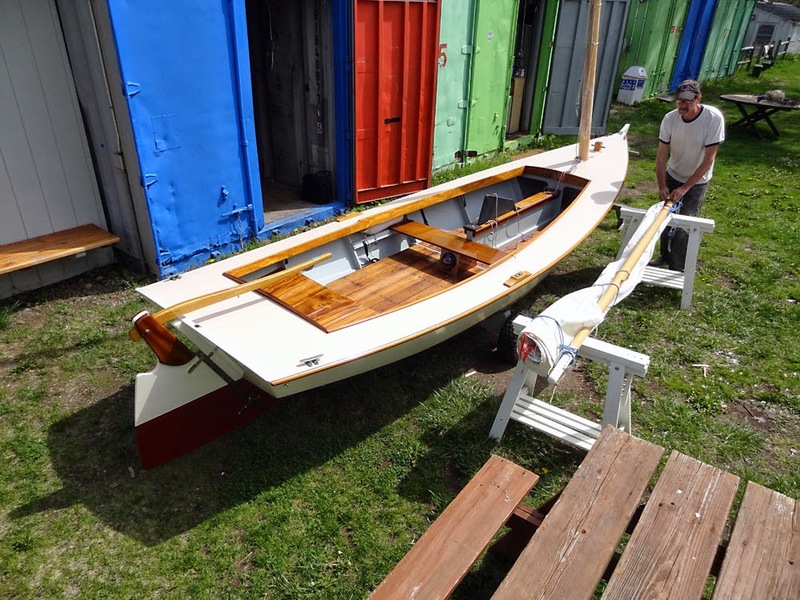 I still have to put a fairlead back on the deck on the port side, to line the halyard up with its beehole through the forward coaming and thence to its cleat. The fairlead will keep the halyard from chafing the side of the mast. 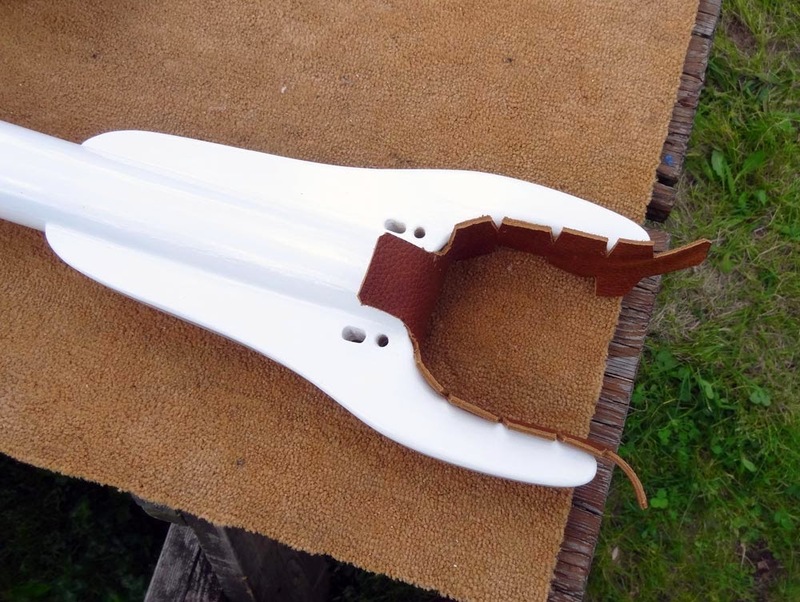 When I was satisfied that the new plan would work, I got out the leather to line the jaws. I keep threatening to buy a whole hide, but I always seem to be able to scrounge up nice big scraps from Kika down the hall, so I'll save my money for now. Leathering a curving surface is a little fussy, and my techniques I'm sure are not the best, but some knife work and canoe tacks does an okay job. The leathers will stay put, I think. I pre-drilled for the tacks to keep the wood from splitting, a fairly necessary precaution. After the first split, I learned my lesson. 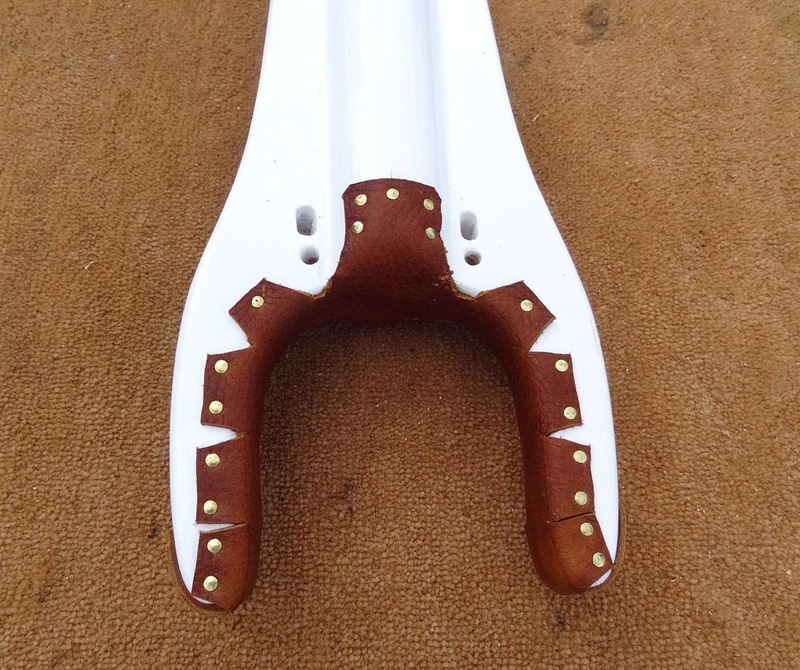 The leather was cut to fit around the jaws. Note beeholes. 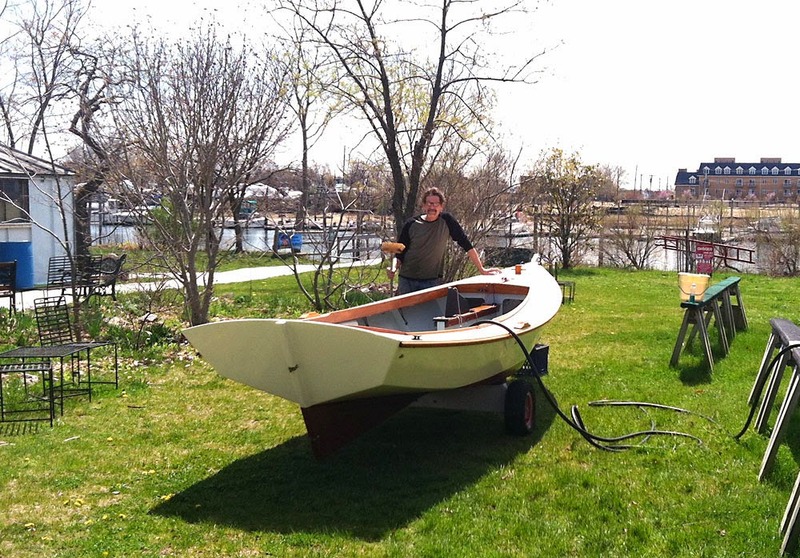 I got Cricket all put back together- floorboards, floatation, dock lines, and ground tackle, then launched her yesterday and went sailing. Cricket was very happy to be back sailing! One little fussy thing is happening. My downhaul seems to inhibit easy rotation of the boom. So I may end up cutting off the key that prevents the mast from rotating. That way, the mast and boom can all move together. I don't know if the vang will still be a problem. 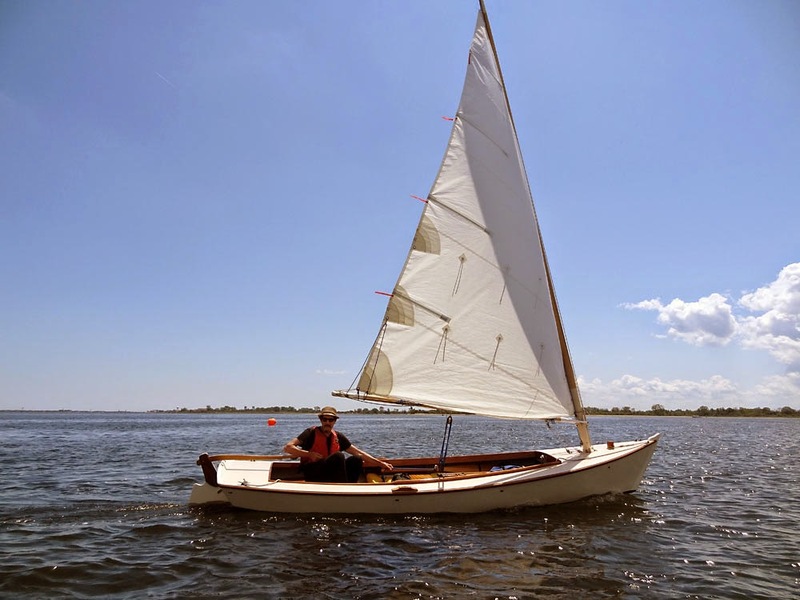 I have to sail it more and think on it a little more. Heading out at low tide, looking for the sand bar. 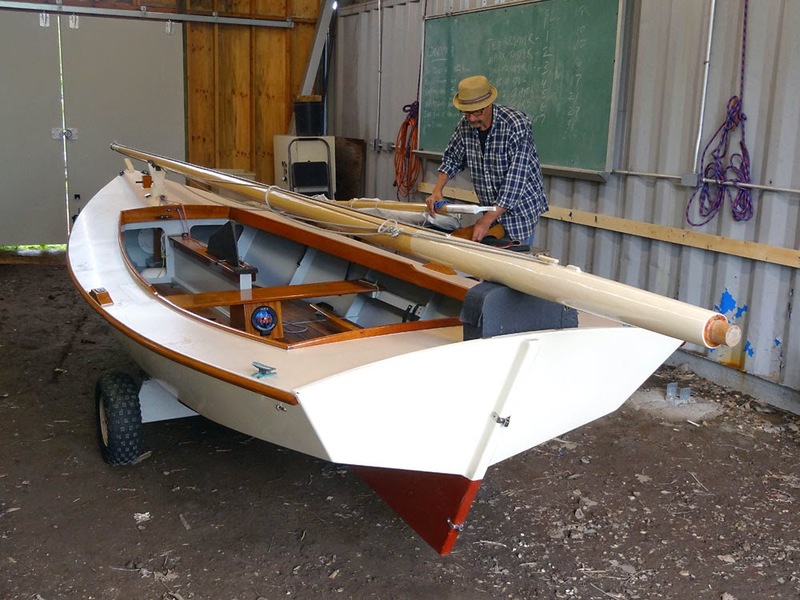 Next time, we'll welcome aboard new Goat Island Skiff sailor Pat Daniels, and have a look at Mik Storer's deservedly popular design. But I need to go for a sail on it first! Nice Jim. I was going to use copper tacks. What size are the brass? Got a source? Sooty is nearing completion. Messed with rig yesterday. Yay! 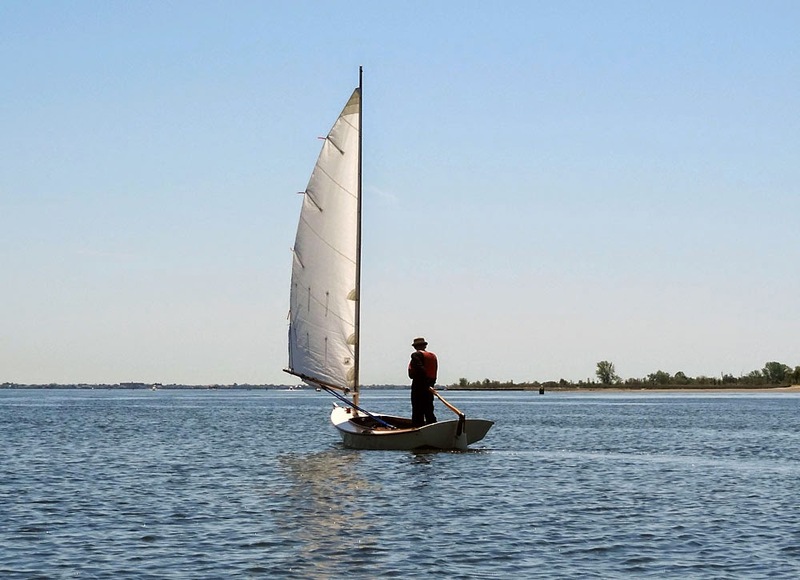 Hope to see both of your lovely boats on the the water this year. when i read about Trace Any Mobile Number In Pakistan Free Software Download - URDU - English frankly speaking according to my experience it is fake i don't think so that it provide information as they described.pakistan news live is updates of latest urdu news in urdu language. 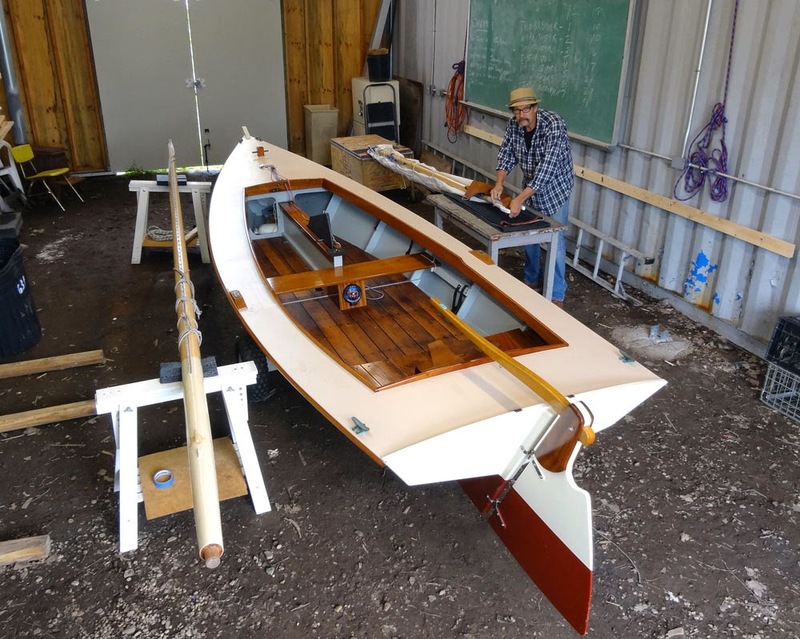 Barry Long's boatbuilding, writing, and photography site.